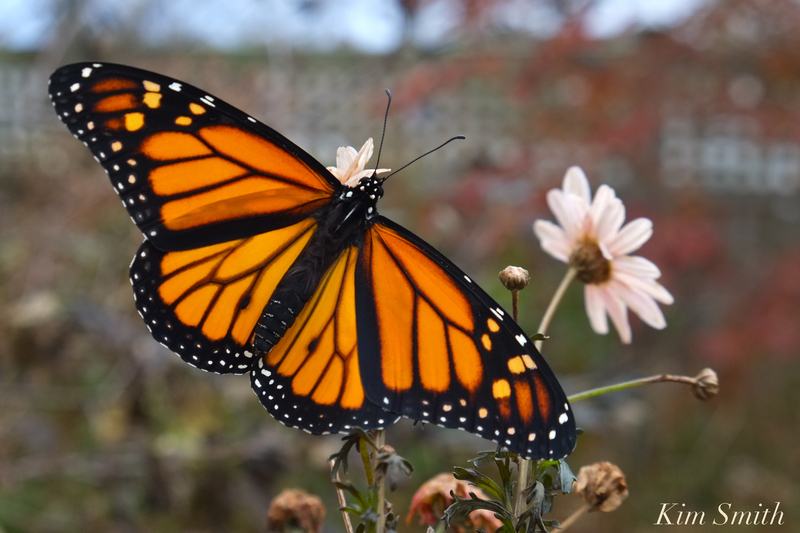 Too cold for the last of our intrepid Monarchs to fly away today. Our last little Monarch to emerge struggled to gain the warmth needed for takeoff. What is the minimum air temperature needed to allow Monarchs to fly? When at Cape May several weeks ago and witnessing a large overnight roost of butterflies, the air temperature the following morning was the same as Gloucester’s temperature this morning–low forties–but the sun was shining. No sunshine today, combined with the low temperature, made flying impossible. Monarchs cluster together in overnight roosts for warmth. Our little guy was all alone on an isolated branch and with temperatures expected to dip into the mid thirties, I brought him indoors for the night. Some Monarchs begin migrating southward as early as August. And as we have seen, during the warm fall season of 2017 in particular, as late as November. The Monarch migration continues until halted by freezing temperatures. This staggered migration is yet another chapter in the survival strategy of the Monarch’s life story. If all Monarchs began migrating at exactly the same time, a powerful storm or hurricane, such as Harvey or Irma, could have devastating consequences on a great many Monarchs. This entry was posted in Gloucester Massachusetts, Lepidoptera, Monarch Butterfly, Monarch Butterfly Film, Monarch Butterfly Migration in crisis and tagged Beauty on the Wing ~ Life Story of the Monarch Butterfly, Cape Ann, Fundraiser, Male Monarch Butterfly, Monarch butterfly, Monarch Butterfly Film, Monarch Butterfly Migration, stragglers on November 14, 2017 by Kim Smith.